There is enough research about triphala to fill a book, but here is a basic introduction to this ancient herbal remedy. Triphala, meaning “three fruits,” is made from the fruits of three trees that grow throughout India and the Middle East: amalaki fruit, bibhitaki fruit and haritaki fruit. These fruits are known for their high antioxidant content and rare ability to rejuvenate (combating aging and stress) and detoxify at the same time. Most detoxifying herbs also strip the body of nutrients, which is why they aren’t recommended for long-term use. But because triphala is also nourishing, it’s safe for daily intake—I’ve been taking it for 10 years myself. I mix one teaspoon of triphala powder in a cup of water in the morning, and let it sit all day (if you’re in a rush, you only need to let the mixture steep for 10 minutes; five minutes if you use hot water). At bedtime, I’ll drink off the liquid portion (like a shot), leaving the sediment at the bottom of the cup. Then I refill the cup with water and let that sit all night. Upon waking, I drink off the liquid portion again, pour the sediment down the drain and mix a new cup for bedtime. If you really can’t deal with triphala’s earthy taste, try taking it in capsule form: two in the morning and two at bedtime. 1. It detoxifies the body. At higher doses (e.g., 2,000 mg), triphala acts as a laxative, but at lower doses (e.g., 1,000 mg), it promotes regular bowel movements by reducing Vata (cold, dryness, gas) in the digestive tract. This means less constipation/straining and easier bowel movements. When you begin taking triphala, you may have a lot of gurgling or loose stool as it moves stuff out of your digestive tract. Just stick with it and everything should settle down in a week. If it doesn’t, try cutting the dose in half (especially if you are a tiny person). 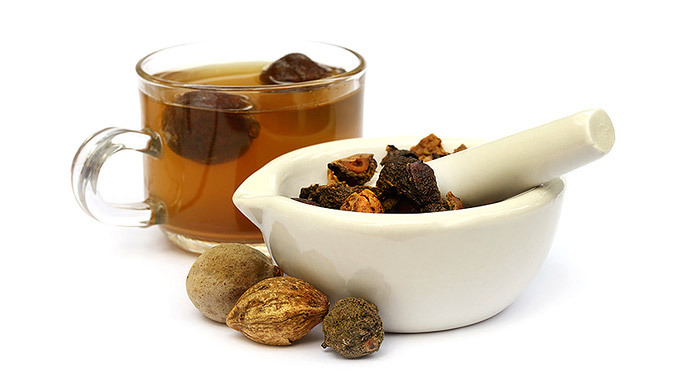 Triphala is also an expectorant, encouraging the release of mucus from the digestive tract. Although we may not typically think of it, mucus plays an integral role in protecting the esophagus and stomach. As it does in the respiratory system, mucus accumulation in the digestive tract leads to stagnation and blockage, which results in sluggish digestion. For those more familiar with Ayurveda, this reduces both Kapha imbalance and ama (fermented, partially digested food) buildup. As an aperient (a gentle laxative), triphala opens physical passageways in the body as well as energetic channels. If you think of the number of ducts in the digestive system—e.g., the pancreas, liver, gallbladder, intestines—you can imagine how powerful this biomedical action can be to release and promote flow in the body. Any blockage of flow in the body, whether in the arteries or in hormonal feedback loops, will result in disease, which is why aperients are powerful prevention. This function of triphala reduces Kaphic stagnation and excess Kapha (which results in congestion and accumulation). Triphala is also alterative, which means it has blood-purifying properties and supports the cleansing functions of the liver, spleen and kidneys. From an Ayurvedic perspective, this reduces Pitta in the blood. Pitta imbalance causes inflammation, and blood is distributed to all of the body’s parts, so alteratives help reduce inflammation across all tissue systems. Infection is another aspect of excess Pitta and triggers inflammation. Triphala’s natural antimicrobial properties help decrease infection and further reduce inflammation in the body. 3. It calms the nervous system. The digestive system is intimately related to the emotional body/nervous system. We all have experienced this relationship with our gut response to stress. Triphala is a colon tonic and carminative (reduces gas). When you keep the digestive system healthy and well supported, it in turn supports the nervous system. Because triphala promotes flow, it can encourage bleeding and even cause miscarriage, so pregnant women and people with active bleeding from any tissue (e.g., bleeding fibroids or ulcers) or dysentery (lower GI bugs that cause diarrhea) should avoid it. There are no known drug interactions. A quality of triphala that is rarely discussed is its ability to promote healthy flow in the emotional body. Personally, I’ve noticed triphala helps me to flow through challenging life situations with greater ease and less depletion. Most herbs are best taken in certain situations or for certain periods of time. But triphala is one formula that really does benefit most everyone at any time.